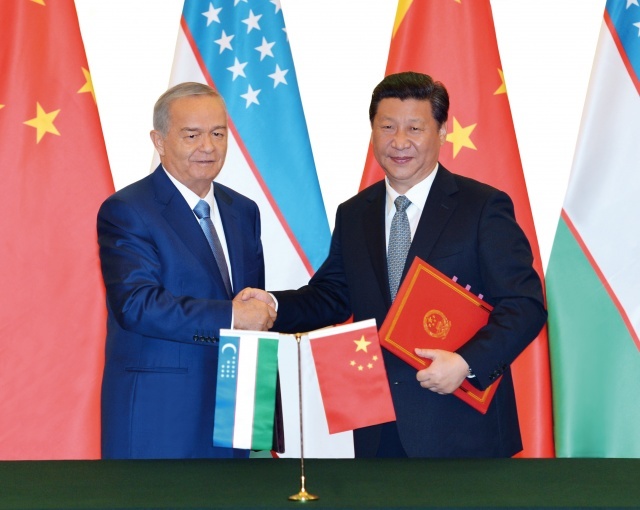 The leaders of Uzbekistan and China continue to strengthen the two countries' strategic partnership. Uzbekistan President Islam Karimov met with Xi Jinping, the general secretary of the Communist Party of China, during the Fourth Summit of the Conference for Interaction and Confidence Building Measures in Asia last May. It is the third time the heads of state have met in person. In their most recent meeting, the two discussed a wide range of issues, including regional and international affairs involving the two countries. Karimov and Jinping have vowed to reinforce mutual political trust and continue reciprocal support as they coordinate future international actions and discuss advancement of economic and cultural cooperation. Jinping said China considers Uzbekistan to be a reliable partner, and that the bilateral cooperation has been progressing on the basis of long-term prospects and reciprocal interests. Karimov said his country places tremendous significance to every meeting with Chinese leaders. Want to get notified whenever we write about Government of Uzbekistan ? Next time we write about Government of Uzbekistan, we'll email you a link to the story. You may edit your settings or unsubscribe at any time.